A recent data analysis that found discrepancies in the Uganda Electoral Commission voter count has put some voters on high alert, and consequently increased the anxiety about the upcoming presidential elections. The data on Electoral Commission (EC) had indicated that there are 15,297,197 registered voters in Uganda. On the contrary, an independent data analysis found a 20,000 voter error margin. Here is another blog showing how we exposed the discrepancies and TMS Ruge’s breakdown of the data. The Electoral Commission was notified about the discrepancies immediately. Instead of giving a detailed account of what happened, the commission made demeaning remarks – arguing that the analysis was baseless. But this was not good enough for the Ugandans who were eager to know what was going on. They continued to pressure the EC through its official Twitter account, demanding that the issue should be taken seriously. In the meantime, media houses started reporting on this issue – pressure was mounting on the commission. The Spokes person of the commission, Jotham Taremwa finally agreed – that this was a “statistical error”. Good morning- the ghost workers on the electoral register. You said baseless rumors, then statistical error. Analysis of voter data per polling station revealed that some polling stations had way more (some over 400) voters than they should have while others had way less. At Nkokonjeru Primary School, a polling station in Ruharo Parish, Mbarara District; the Electoral Commission data shows that there are 436 Female Voters and 359 Male Voters – the total voter count (Female + Male) =387. Once we analyzed the data, we found that 408 voters were not accounted for. At Nyamitanga Muslim Pri Sch, in Katete Parish, Mbarara District; the data indicated that there are 247 Female Voters and 202 Male Voters – the total voter count according to the commission = 900. Our analysis found that this was NOT correct. Overall I personally came to the conclusion that there are probably not just 20,000 ghost voters but many more. If the Electoral Commission indicates that there are 387 voters at a given polling station and yet when I add number of Female (436) + (359) Male voters at the same polling station I get 795 I cannot help but wonder where the commission put the missing 408. This morning (11, February), the commission quietly took down its website and removed the document we analyzed and replaced it with a new document with changes that seem to address the concerns we had. Well, some tweeps noticed that the website was down, which forced the EC to make this lame excuse. If you ask me, @UgandaEc looks really bad & incompetent right now, taking down their website after being busted with register discrepancies. With just 5 days to the polls I am not convinced that the commission is prepared to handle emerging issues especially when they involve discrepancies. If the commission failed to compute the sum of a couple of hundreds (as indicated above), how can they convince Ugandans that they are ready to tally millions of votes from over 28,010 polling stations country wide? EC went into a coma after we published a simple analysis of data they should have crosschecked and rechecked many months and weeks ago. If anything, this shows how unprepared the commission is. Even though the commission has finally realized that our analysis was NOT baseless (as it originally claimed) – seeing that EC has updated its data to match our figures, the manner in which they did it is unacceptable. With no explanation to the public. 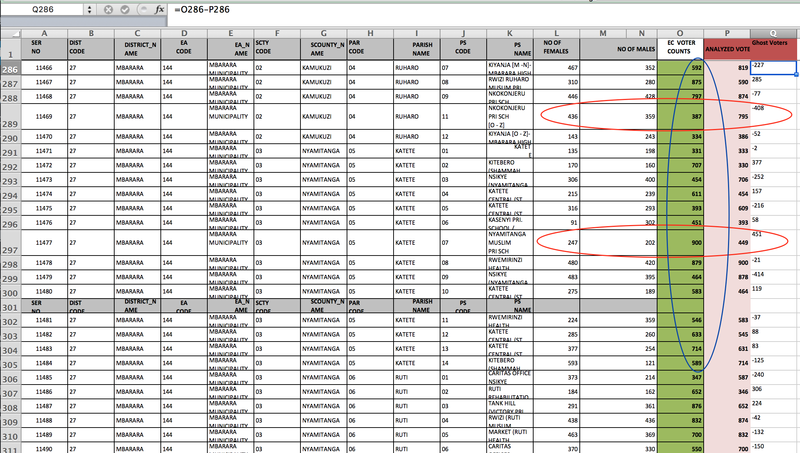 What is even worse, in the latest version of data, EC has eliminated the columns showing the number of Male and Female voters per polling station leaving just the total voter count per polling station. Taking away the demographics makes it impossible for us or anyone else to do further analysis – and that is probably what the EC wants. But, this does not mean that there are no more loopholes in the voter registers. “Luckily”, the EC has procured handheld Biometric Voter Verification Systems and they are expected to catch any anomalies the commission might have missed. But, I have a feeling that at many of the polling stations, especially the rural ones (which are the majority in number), they will have to rely on the paper based register – because (sometimes) technology fails. For now, I will keep crunching the voter register data as I anxiously await for the EC to deliver its promise of a “free and fair election”! With just about 9 days to the 2016 presidential elections, many Ugandans are itching to vote. According to the Electoral Commission (EC) of Uganda, almost everything is in place for the February 18th polls and a free and fair election is guaranteed. But the polling station (accessible here) voter counts released by the Electoral Commission show a major flaw in the upcoming elections. The data shows that there are 15,297,197 voters in Uganda. In terms of gender demographics, the document indicates that there are 8,027,803 Female and 7,249,394 Male voters. However, the sum of female and male voters as indicated in that document yields 15,277,197 NOT the said 15,297,197 (as indicated in the document). Note the difference of 20,000 voters. When a friend (@enamara) alerted me about this irregularity, I took the data provided by the Electoral Commission and converted the PDF document to Excel and started analyzing the data per polling station. I inserted one more column “Analyzed Voter Count” in the document and I put it side by side with EC’s Voter Count for easy comparison. First I applied a simple formula to get the sum of Male and Female voters per polling station. Once I got the sums, I compared my sum per polling station with EC’s Voter Count (sum) per polling station. The results speak for themselves, showing the disparities. Many of the polling stations have voters that are ‘unaccounted for’. The cells highlighted with a red background indicate polling stations with what I can only term as “ghost voters”. Overall, there are 20,000 voters who are unaccounted for based on the gender demographics. At the moment it is not clear whether this is a systematic way of fixing votes or a “human error”. Regardless of where these 20,000 ghost voters come from, with such flaws, a free and fair election is still a dream. If the electoral commission cannot deal with these simple numbers – especially now that there is no major rush, can we trust them with vote tallying in one day? Evelyn Namara noticed these disparities 3 days ago and she contacted the commission via Twitter. She has not received a response from the commission since. We should condemn this negligence and call up on the Electoral Commission to account for the 20,000 voters. 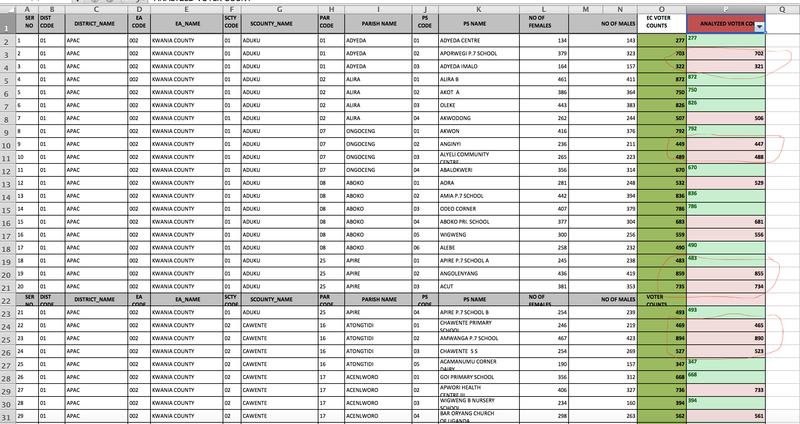 Download the Statistics by Polling Station – Data Analysed -Uganda – this is the Excel Sheet with data I analyzed. I have password protected the document just to make sure that no “unintended” alterations are made. If you want to do further analysis, tweet me @jssozi and I will give you the password. You can also use this Electoral Commission Database (http://www.ec.or.ug/ps/list/) to verify number of voters per polling station and also download polling station information including voter registers.